Please read these documents very carefully. They contain the essence of this fascinating tale. Top: The Director General's Post Office Circular was in internal document sent by the DG to various Post Masters advising them in advance of any changes (additions, deletions and modifications) in existing postal policy and procedure. The Circular above informs all Post Masters about planned issue of these stamps. 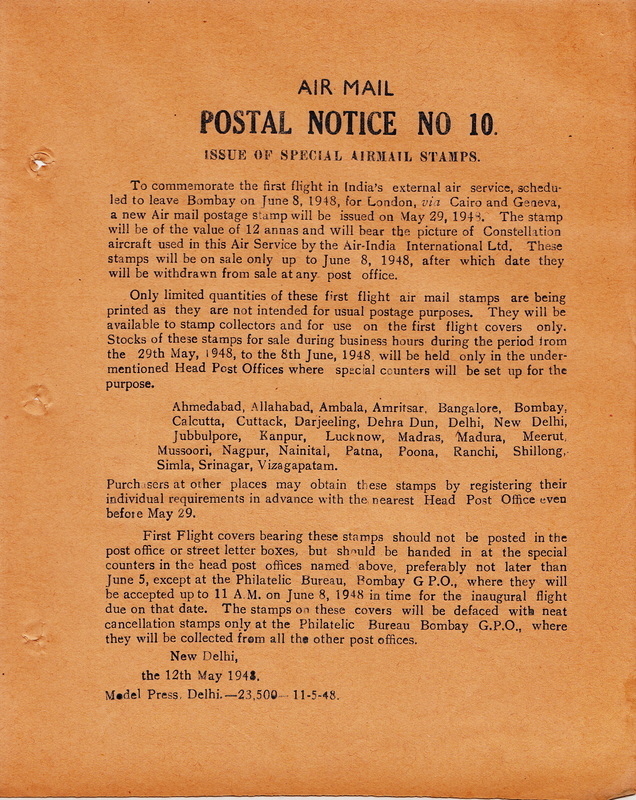 Bottom: The Air Mail Postal Notice was meant to be displayed on the notice board in Post Offices, and was intended to inform the public of changes in the Postal System. The Notice below deals with the issue of these stamps. Postal Notice No. 10 below is from the Rudraksha Collection - image courtesy Harsh Gupta. Top: One of the only two extant postal notices. It gives details of the stamp as well as special instructions for preparing covers for the flight including the various bureaus at which covers would be available and accepted, and the procedure for the same. Arrangements for back stamping or lack of it at Cairo, Geneva and London is also mentioned. Bottom: The issue also received wide publicity in the newspapers, and was written about across the country. The news clipping below appeared in the New Delhi papers.